Today’s dish is something I have come up with while going through somewhat of a prawn obsession. You know when you know what you want to eat but not quite know in what form? 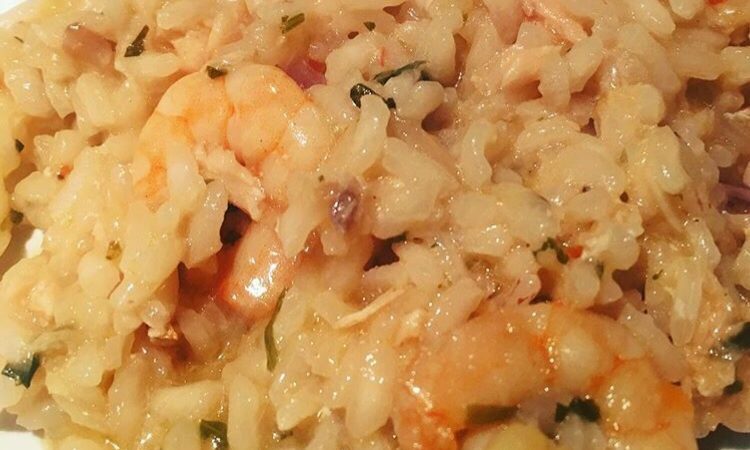 Well I wanted risotto, and I wanted prawns and I wanted salmon, so I thought why not? Couldn’t find any recipes that I liked online so I just went into the kitchen freestyled and a house favorite was born. I am sure that there is a proper way to make this, but this is how I make it. Mix your hot water with lemon zest and juice along with your herbs, pepper and salt. Set aside. Heat up some butter with a teaspoon of parsley and a teaspoon of oregano and a teaspoon of chilli flakes Pan-fry and shred your salmon, add in the prawns and cook until pink, then set aside in a bowl. Add your rice and stir until all the rice is coated in the flavored oil. Continue stirring until you can smell the toasted rice. The edges should be translucent. Start adding your hot water one ladle at the time. Wait for the water to be absorbed before adding the next ladle. THIS IS VERY IMPORTANT. After about 12 minutes, taste the rice to check how far it has cooked. Add more seasoning as needed. The risotto is ready when if you run your wooden spatula through it, it should flow slowly back into the space. It should not take longer than about 20 minutes to be fully cooked. Add one more ladle of water, the prawns and shredded salmon along with the Parmesan and two tablespoons of butter to make it creamier.